Many people are confused about the difference between products labeled, “All Natural” and “Organic”. When a product is labeled, “Natural”, it simply means that there are no artificial ingredients added during the processing or packaging of the product. These include things like artificial sweeteners, artificial flavorings, artificial colors, preservatives, etc. It does not, however, tell you anything about what that product was exposed to prior to packaging or processing. In other words, hamburger can be labeled “all natural” as long as when it is processed or packaged, nothing artificial was added. It has nothing to do with what the animal that hamburger came from was fed or exposed to. The animal could have been given antibiotics, growth hormones, fed genetically modified feed and grain, or grazed on pasture that was treated with pesticides and herbicides. All of these will be present to some extent in that meat. Milk is another good example. Milk can be labeled “all natural” as long as no artificial coloring, flavorings, preservatives, etc., were added to the carton. But whatever medicines the cow that milk came from was treated with, and whatever chemicals the cow ingested, are likely to be present in the milk. Likewise, green beans, or any other vegetables, fruits, nuts, grains – basically any kind of food that occurs naturally – can be labeled “all natural” as long as no artificial ingredients were added to it after it was harvested. But while it was growing, it could have been saturated with chemical pesticides and herbicides and grown in soil with synthetic chemical fertilizers that can be absorbed by the plant. Some of the chemical spray can be washed off, but not necessarily all of it. On the other hand, if something is labeled, “organic”, it means that it was grown free of synthetic chemicals, irradiation, sewage sludge, or genetically modified organisms. Certification for organic meat forbids use of growth hormones, antibiotics, genetically modified feed, or animal by-products in the feed at any time throughout the animal’s life. It also means that they did not graze on chemically treated pasture or eat other types of chemically treated feed. There are many reasons to eat organic food. Organic food is generally more nutritious than non-organic food. The soil that organic foods are grown in is usually more nutrient-rich than soil that has been stripped of its nutrients and replaced with chemical fertilizers that are designed more for rapid growth and higher yields than nourishing the plants. A tomato grown in soil that has been leached of its nutrients relying on chemical fertilizers will not have as much nutritional value as a tomato grown in soil that is rich in the nutrients that make it grow strong enough to resist diseases and insects without chemical additives. Those nutrients are absorbed by the plant and, generally speaking, a side-by-side comparative analysis of any two foods, one grown organically and one grown with synthetic fertilizer, pesticides, and herbicides, will show the organic food to have more nutritional value. Also, many of the chemicals used in the growing and production of non-organic foods are linked to serious diseases including various types of cancer. Those chemicals also soak into the ground, eventually making their way into wells and aquifers that supply communities with drinking water. If we are strictly concerned with our immediate personal health, fruits and vegetables that have peels or rinds that will be removed before eating are less of a threat as, for the most part, the harmful chemicals will not penetrate to the inside. Examples would be bananas, avocados, and oranges (provided you don’t use the orange peel as flavoring in something else). But I remember standing on the Caribbean side of Costa Rica with a large banana plantation on my left and the crystal clear ocean on my right. The bananas, even though the bunches are wrapped in what looks like some kind of burlap for protection, are heavily sprayed with pesticides. The rain washes all of those pesticides into the ocean and from where I was standing, the once thriving coral reefs were bleached white and completely dead for as far as I could see and well beyond. It was at that moment I realized that it’s about more than just about the banana. There is, literally, a “trickle-down” effect that goes well beyond the food itself, impacting our soil, water, and even the air we breathe. The impact of commercial agriculture on our health, and the planet, is significant and there is plenty to be said about it. We want to be aware of getting as much nutrition as possible from the food we eat. Also, because we know that many of the harmful chemicals used in commercial agriculture are linked to many physical diseases and disorders, it stands to reason that they may also be involved in some of the mood disorders, like depression and anxiety, that are rampant in today’s Western world. Chemicals that we ingest, whether they are in the form of nutrients or toxins, affect our bodies, and brains in particular, in myriad ways that we do not yet fully understand. When we are trying to correct “chemical imbalances” in our brains, it makes sense to feed our brains with good chemicals (nutrients) and avoid feeding it toxic chemicals that may have adverse effects. Consider growing your own organic (heirloom) if you can. Supplement with select organic at farmers market/grocery stores. 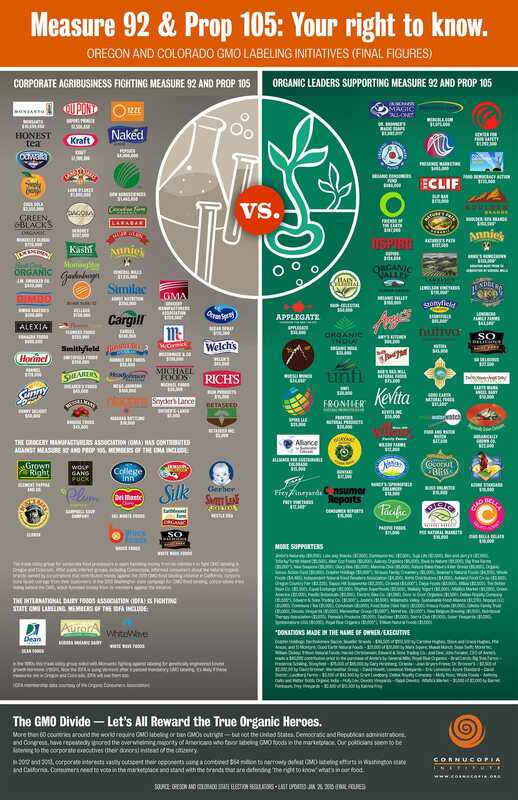 Some Companies that sell organic, are against GMO labeling of products, while others are in favor of GMO labeling. GMO labeling – such a critical issue! And the preservation of good seeds. Good points once again, Dena! Thanks.